His appointment was widely heralded and brought about an almost-unprecedented wave of positivity. After all, Nigel Adkins is a positive guy, with a positive record in management. He will kick-off the latest chapter in his career in August, when Sheffield United make the trip to Gillingham, aiming for his fourth promotion from League One. How can he do it? Well, after establishing a reputation as something of a promotion specialist, it’s fair to assume he has an idea. Perhaps wisely, one of the overriding ideals to come out of his early Press briefings was to call for a united front. We can achieve if we’re together, Adkins said. Dean Wilkins, one of his trusted lieutenants, reckons that is one of Adkins’ biggest strengths. Everyone is made to feel as if they are a vital cog in the overall wheel. It is a refreshing prospect at a club which often feels divided, rather than United. Last season’s disappointment in the league was tempered slightly by more knock-out success. But, for some, patience was running out. Supporters argued amongst themselves on the away end during a 1-1 draw at Scunthorpe. Another failure in the play-offs was the final straw for many. Players could sense the tension in the atmosphere; on more than one occasion, they fell behind early at Bramall Lane last season and began rushing around as if they had 70 seconds to force an equaliser, rather than 70 minutes. It’s hard to believe that wasn’t a contributory factor to United’s troubles at home last season - they won only ten of their 23 home league games and scored just 35 times, the ninth-best record in the division. When Adkins took Iron to the Championship in 2006/07, they lost only two games at Glanford Park; and Bramall Lane co-chairman Kevin McCabe is hoping for similar results in South Yorkshire. “I don’t think Nigel would have joined us if he didn’t think he’d get the support from the board to get back to the Premier League,” he said. “We are a good fit. “Bramall Lane has fantastic support, above all League One clubs and a lot in the Championships. 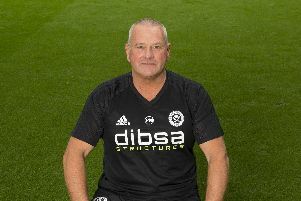 “With success next season, and perhaps a bit more goalscoring adventure, Bramall Lane will be a cauldron again and become somewhere that opposing teams wish they didn’t have to visit.